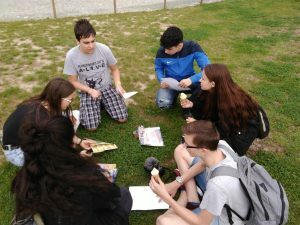 The project is the reaction to the necessity of development students´ key competences via active learning. It provides an exchange of good practices in the field of experience-based learning and cooperative learning. 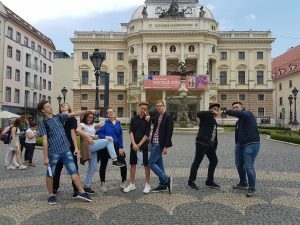 The contents of the project are devoted to the topics of culture and arts, environment with activities focused on pollution of water sources in the Central Europe, mainly rivers flowing thorough the town where the school is situated, it means Danube, Moravia, Elbe, Chrudimka and Leitha. The next topic is business learning connected with application of mathematics and digital skills, sports like a tool to strengthening of fellowship and fair play. 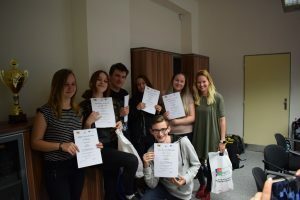 The target group are students of secondary vocational schools, from the total number of 200 students, it will be 80 direct participants of activities performed by means of Olympic Games. The rest will take part in the next project activities in the given country. Within the project four international meetings will be organised. 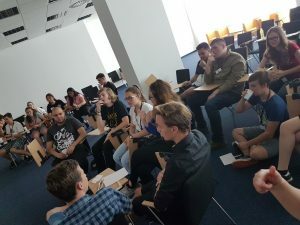 It will last 2 days and it will be held like European Olympic Games (EULYMPICS) in disciplines due to the main project topics like a triathlon. 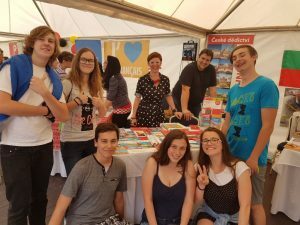 The group of 6 students and 1 teacher from each school will take part on every international meeting. International competition teams will be formed of students and one international team of teachers will take part in a competition. Within a CULTURAL OLYMPIC GAMES (Bratislava) triathlon will be organised in disciplines e-quiz Know the famous art work, competition in artistic representation of historical event or his famous personality. 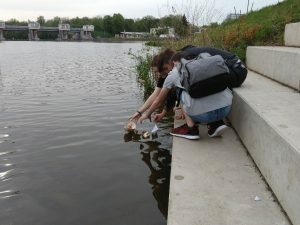 ENVIRONMENTAL OLYMPIC GAMES (Pardubice) will be organised like triathlon in water analysis, geocaching and recycling. BUSINESS OLYMPIC GAMES (Vienna) will be held like triathlon in the live game Monopolies, the design and production of project T-shirt, competition in Business scrabble. SPORT OLYMPIC GAMES (Bratislava) will be organised in floorball with limitations, badminton in regional costumes, relay-race in masks. The Organising Committee for EULYMPICS Competitions will be formed of teachers as well as students. 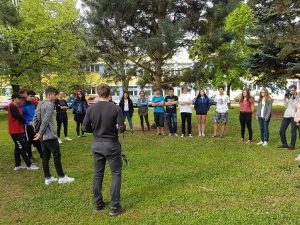 On Tuesday afternoon groups of students and teachers from Austria, Slovakia and Czech Republic gathered for Environmental EULYMPIC games. First we had a chance to get to know each other better during fun name game. 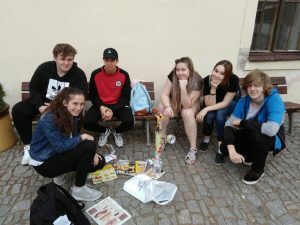 After this first step, we made international students teams mixed from each country (6 students in each) and we started orientation games around Pardubice to get to know better the places and team up. In various locations of the city: Elbe river, Pardubice castle, Green tower, Statue of the pilot, etc. 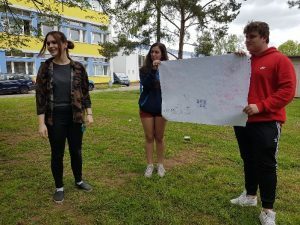 – teams had to test their technical skills how to make a boat from the paper (that was fun race), a plane that will fly as further as possible, create a tower that withhold an egg, etc. 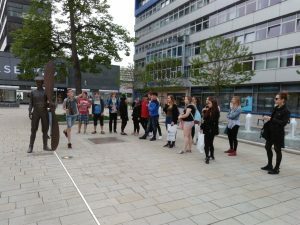 Together we got to know history of the city and helped each other to accomplish the tasks as a team. We got ready for tomorrows next chapter of the games – geocaching. So after a rest, second day brought us to whole day of adventure. 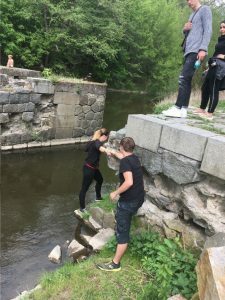 All teams with guidance of GPS, clues and maybe some little tips of SPSCH Pardubice teachers, had to find hidden caches alongside the Elbe, Chrudim rivers and some ponds. 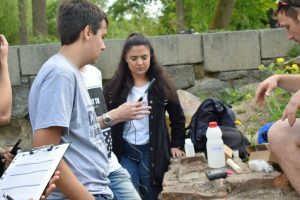 Also in each spot teams had to make water analysis that explains quality of it and how to determine it by different parameters (PH, level of oxygen, etc.). We discovered how important is influence of the surrounding (households, factories, other waters, etc.) and how humans influence that too. 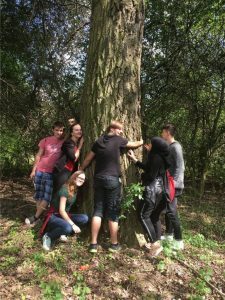 In addition, we had to accomplish some teamwork tasks (create team secret handshake, motto, express how we love mother nature, bring our teammate from A to B). It was quite a day, quite a challenge, and quite a fun. 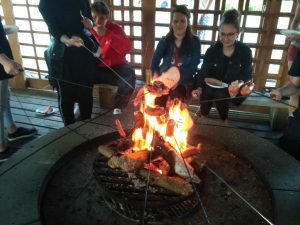 This day we had ended with an amazing BBQ in the park with games, grilling, chatting, singing and just enjoying nature of Pardubice. Our last day we have started with evaluation and reflection of previous days. All teams received feedback on their performances. All good for their efforts and their accomplishments. Even it is not a race, but a race of teamwork and knowledge. Good job! Then we had a get to know game – Human Bingo. Really nothing bad for us, but very funny game to get to know different sides of our team mates. Now we know some best moves of some of friends, their favourite colours, who can play some instruments, have really funny animal expressions, etc. 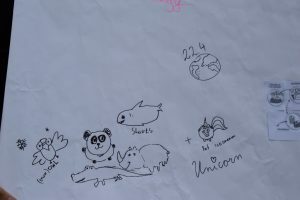 After we got stronger as a team, we had a little session on recycling. Not all of us had a good knowledge about it, but we had a chance to practice during team game. 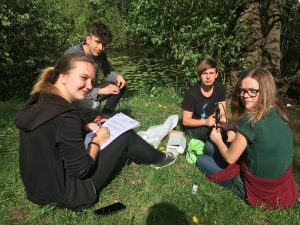 We had to decide on to which category given trashes belongs to (paper, plastic, glass, compost or not recyclable) and complete different tasks: ask colleagues how to reuse plastic bottle again, name the date of the Earth Day, list out indigenous species that are affected by pollution, list out things what can I do to help recycling, etc. That was fun game and we really got to know so much about it in practice and not only by talking about it. 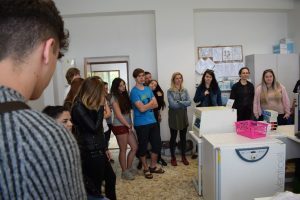 All Environmental Olympic games ended with excursion at SPSCH Pardubice school getting to know Chemistry labs, shooting range of Security studies and more. Then we got to reflect on whole days, give our feedback, get our certificates and we all got some prizes and gifts to remember these games. 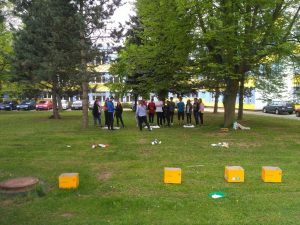 We are looking forward to the next EULYMPICS! 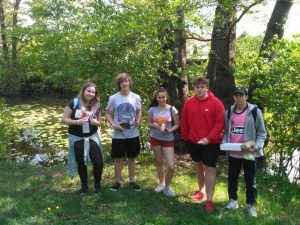 I think the best thing of the Environmental EULYMPICS was seeing all those important “reactions” in the nature. Actually understanding it’s main purpose. 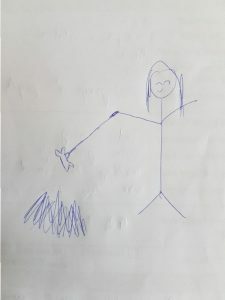 I think the project was fine. I met a lot of new people and have been at the new place. The competitions were fine. I had very fun with the other people. They all speak other languages, but they can be very good in English. 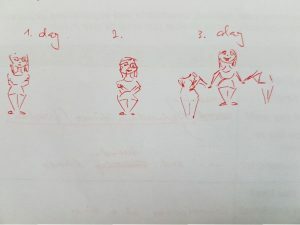 It was a little bit difficult, when I would answer the question. It was very nice and I am thankful that I could be here. The mates were very friendly and the team leader also. My team “Deadcats” is awesome and Mr. Meloun is the best teacher. So here we go again to another EULYMPIC games – Cultural. 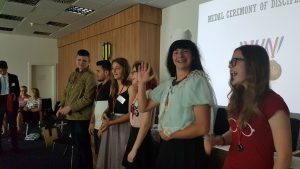 Now 32 representatives from three countries – Austria, Czech Republic and Slovakia – gathered in Bratislava – Stredná odborná škola chemická. 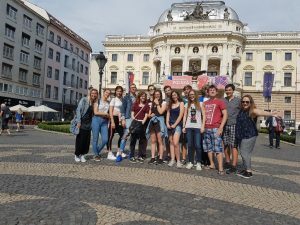 Our first day started with excursion around Bratislava which was guided by local students and we had a chance to visit market and short concert for European days. That was a nice surprise. 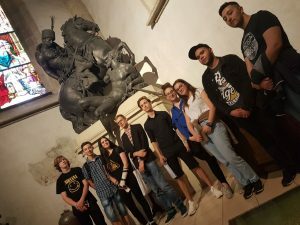 We visited Čumil sculpture, Hrad – Bratislava castle with beautiful view and the garden, Kostol Klariský – Klarisic Church that is one of the oldest church in Bratislava and so much more. 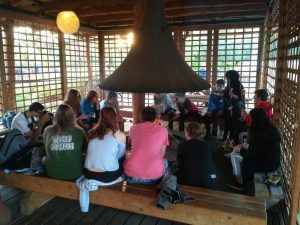 Also during and after the traditional Slovak dinner in very nice green park we all played getting to know each other games, where we had some funny moments to remember. 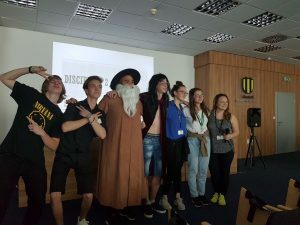 Second day began with an official opening ceremony of Cultural EULYPICS with carrying fire torch, Headmistress of SOSCH warm welcoming speech, traditional Slovakian song and here we go to our games. We have started with game that moved our brains. 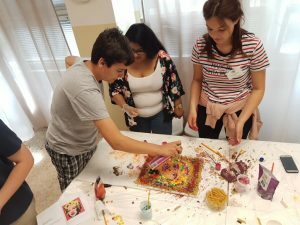 Mixed teams of students and also one teachers team took part in an e-quiz “Know the famous art work and more” where our knowledge was tested from cultural, geographical and generally intellectual point of view. Do you know what is the origin of „Trdelník“? Well, we know now. All in all, we had a great fun and success and got rewarded with medals. Then we continued with a competition in artistic representation of historical event or its famous personality. This part exploded with creativity and great humour. 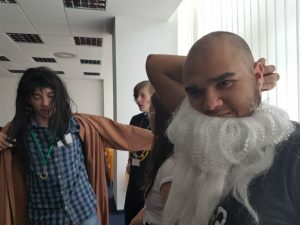 In the end we had brilliant performances of Mona Lisa and Leonardo da Vinci in sci-fi scene that saved the Earth; Maria Theresa and Napoleon in soap opera episode where they got to know that they were related. What a drama! You can just imagine how it was. We can admit that it was sometimes challenging in preparing it, but we did it all together. 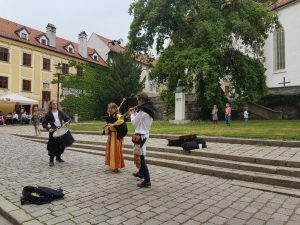 In addition, our group of spectators from Austria had an opportunity to learn Slovakian folk songs and they did amazing job by performing it live as well. What an accomplishment!? 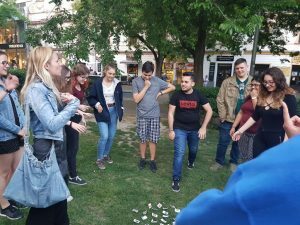 After this part of the day we continued in playing orientation game around Bratislava. 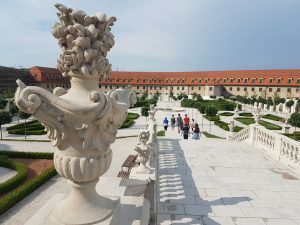 We have found very interesting architectural buildings that are important to the cultural development of the city, how it was affected by Slovakian artists, how important were some locations for local community. Some of it considered as hidden treasures. 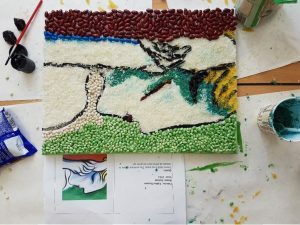 On the last day all teams and all spectators gave their best in recreating well known paintings in a Food art game. 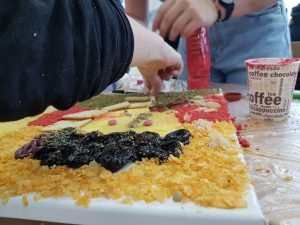 It was funny to use beans, pasta, cookies, rice, M&Ms in our art work. During interpretation of some paintings we even got a minion character – which, by the way, was voted as most original peace. 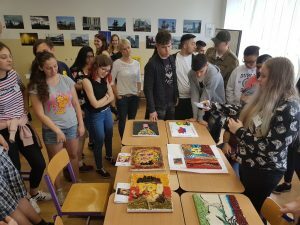 We hope that these art works will remain hanging on the walls of SOSCH and remind of our creative performances during EULYMPIC games that was brought by Erasmus+ programme. 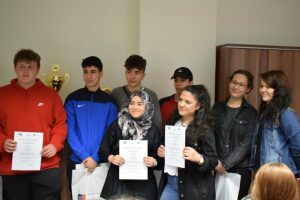 During all games teams were awarded with medals and in the end we all got certificates – so all of us were great participants of the games. 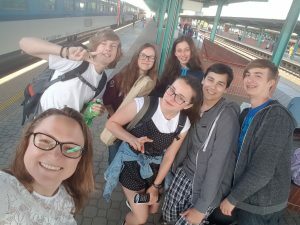 We had a chance to reflect on the days, evaluate it, remember Environmental EULYMPICS and discuss shortly what is next in our project, which is very exciting. 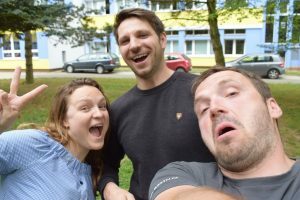 Let’s prepare for the next one in Austria – Business EULYMPICS! We will create an EULYMPICS t-shirt.